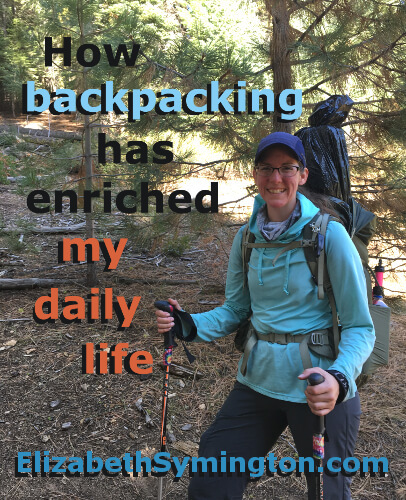 This is Day 21 of the 31 day series on “How backpacking has enriched my daily life.” I expected lightweight backpacking to be a hobby. Instead it has transformed me for the better. Backpacking introduced me to solar, gravity and hand crank flashlights/lanterns/headlamps. I love the idea of not being dependent on electricity for lights. In my emergency kit at home, I have the MPOWERD Luci Lux – Inflatable Solar Light *, which I love because it produces light for up to 12 hours. It is also really fun to inflate! My Luci Lux makes for nice mood lighting that is also bright enough to read by! I’ve also taken this lantern with me on backpacks, where I hang it on the outside of my pack so it can charge while I’m hiking. 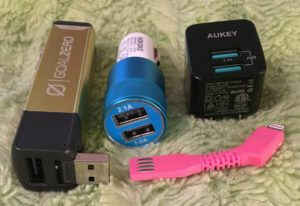 By getting my backpacking gear in order, it also helped me to organize my iphone accessories for when I travel. Thanks to backpacking it has helped me to be more organized when I travel and it has introduced me to solar, gravity and hand crank lights. Next time I upgrade by backpacking gear I’m going to look into buying a solar powered headlamp, so that I don’t have to carry a wall charger or extra batteries!